THESE FARES APPLY FOR PREMIUM ECONOMY CLASS SERVICE. 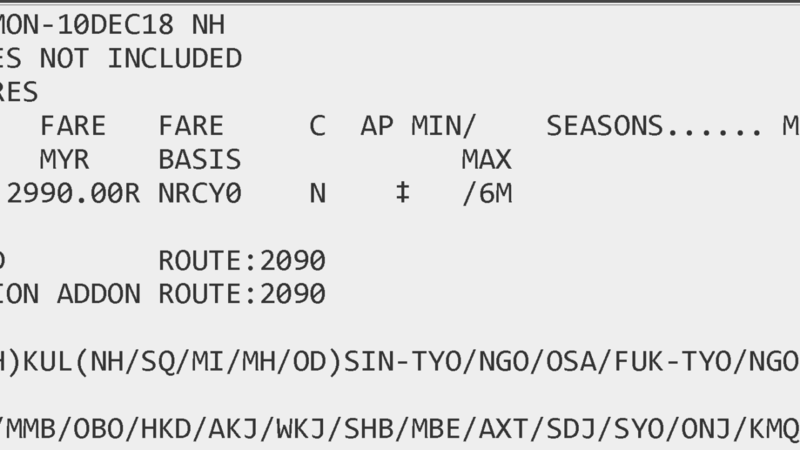 ANY NH FLIGHT OPERATED BY NQ. ANY OD FLIGHT OPERATED BY OD. ON TLC DATE NO MATTER THE STATUS IS. THE MORE RESTRICTIVE TICKETING DEADLINE APPLIES. FREE IN KUL IN EACH DIRECTION. FREE IN SIN IN EACH DIRECTION. PER ADULT. CHILD/INFANT DISCOUNTS APPLY. INTERNATIONAL SECTOR ON/AFTER 06DEC 18.
INTERNATIONAL SECTOR ON/AFTER 02SEP 15. TICKETS MUST BE ISSUED ON/AFTER 05DEC 18. TICKETS MUST BE ISSUED ON NH OR UA. OR – TICKETS MUST BE ISSUED ON NH OR LH. OR – TICKETS MUST BE ISSUED ON NH OR LX. OR – TICKETS MUST BE ISSUED ON NH OR HR. 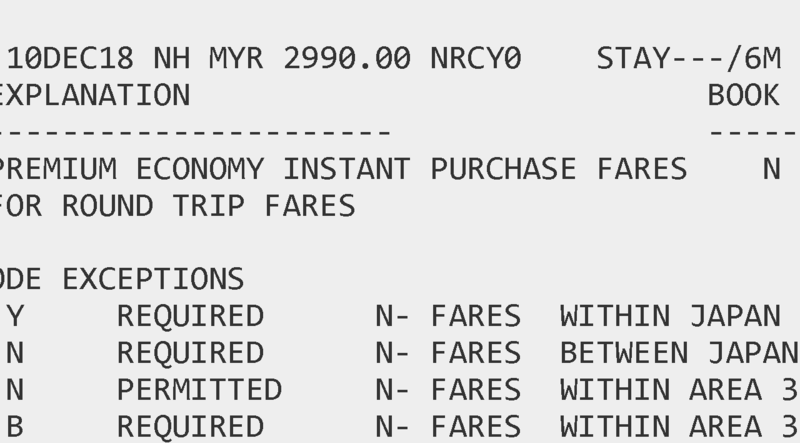 CHARGE MYR 300.00 FOR CANCEL/NO-SHOW/REFUND. THE FOLLOWING RULES APPLY PER PRICING UNIT. CHARGE MYR 200.00 FOR REISSUE/REVALIDATION. 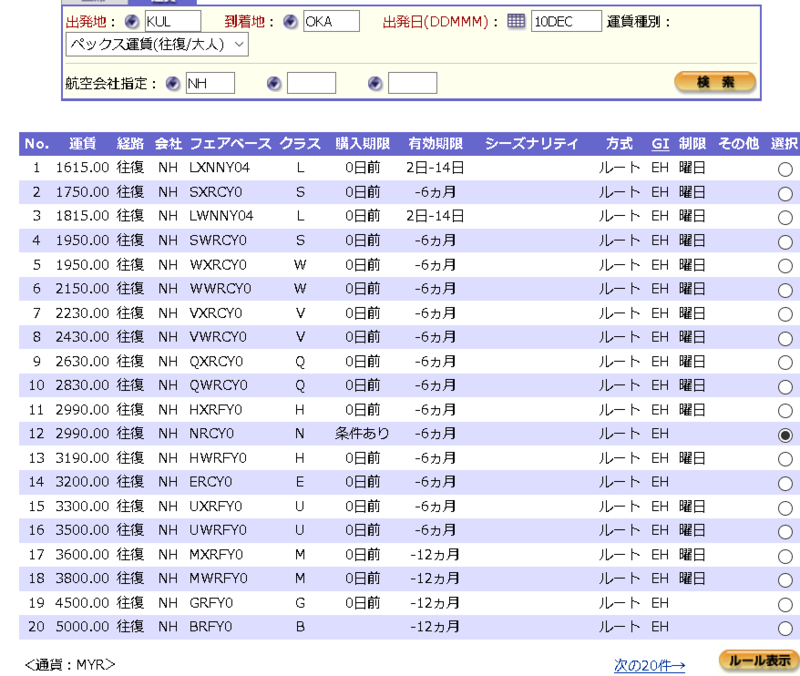 ANY CHANGED FARE COMPONENT IN THE ITINERARY. CHANGES NOT PERMITTED IN CASE OF NO SHOW. PLEASE REFER TO REFUND SECTION IF APPLICABLE. OCCURS TO OUTBOUND OR INBOUND FLIGHT. FARE THE DIFFERENCE WILL BE COLLECTED. 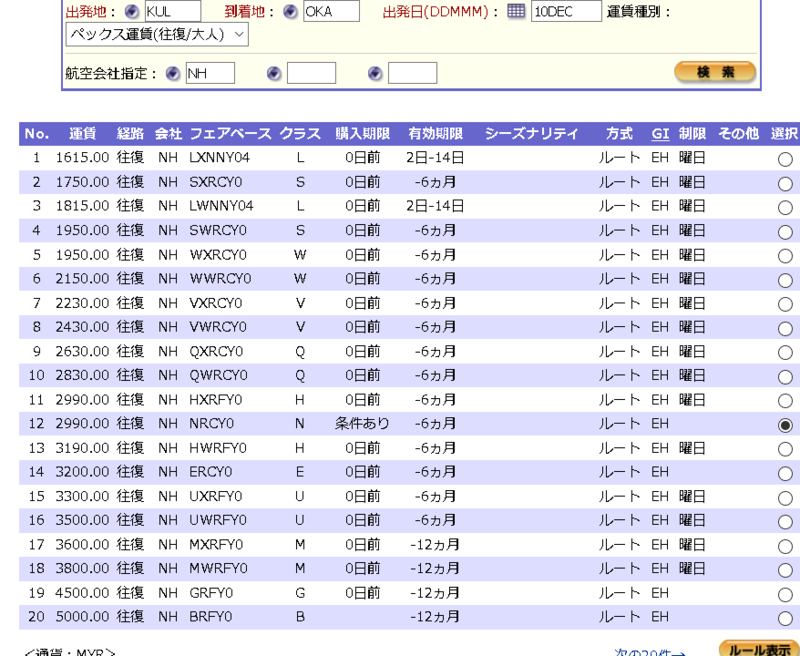 A CREDIT OF THE RESIDUAL AMOUNT WILL BE MADE. REFUND OR NOT APPLICABLE AT ALL. FOLLOWING APPLIES AFTER DEPARTURE ONLY. ON THE TICKET IS PERMITTED WITHOUT PENALTY OR ADC.